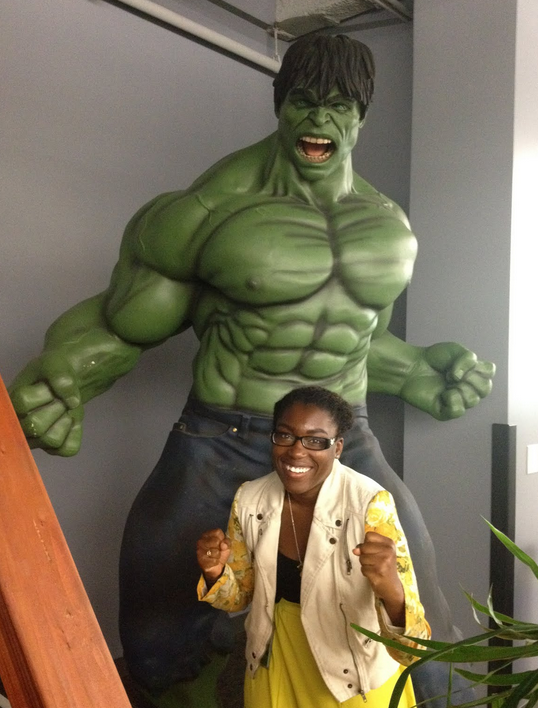 For today's post, meet Marieh Scales, a BOLD intern on the People Operations team in Mountain View. I collect stickers off of fruit. I am part of Management Leadership for Tomorrow (MLT), a career prep program, of which Google is one of the corporate partners. Through the program, I was able to visit the New York office and better understand the many different roles within Google. That trip helped me realize that Google wasn’t solely a tech company and that there are many other equally important roles that make Google a wonderful company. As a potential intern, I enjoyed learning about how valuable employee development is to Google as a company, and I was sure that if selected as an intern, I would not only further develop my pre-existing skills, but I would also learn new skills. I am working in People Operations, specifically in the PeopleDev organization with the Metrics and Evaluation team. I have been tasked with two major projects. The first is to reverse-integrate two major websites (and other online resources that overlap with similar content) to create a one-stop-resource for Program Managers and Program facilitators. This resource will outline all phases of the program design cycle, including assessments and evaluation. In addition, I help to improve the user-functionality of a dashboard which helps Program Managers evaluate and conduct post-program survey analysis. In essence, both projects will simplify the process of conducting program evaluations and assessments. My team are also such comedians! I laugh a lot, but at the same time get so much work done. They make Google an even more enjoyable place to work. Each team member has their own super skill, which makes my team all the more phenomenal. It was not hard to transition from school to Google. (I had two days between the end of the semester and my start date.) I love the fact that the dress code is, “just wear clothes,” and that there is flexibility with the hours in your day. Also, I like working in a huge workspace with five other people. I never feel isolated or alone, plus it makes it easier to build a relationship with my team. I’m looking forward to the completion of the reverse-integration project that I spoke of earlier. While I am sure the project will be completed and easier to use than previous versions, I am anxious to see how many people will utilize the website! The Brazilian Samba class! UJam is a close second! Being Googley means being your genuine self. There is no right or wrong way to be Googley—as long as you treat others like you want to be treated! I don’t feel like I need to hide my interests, or be dishonest with people. It’s ok to say, “that [insert music/sport/game/etc.] just isn’t my thing,” and I am not judged for that. Dance! Give me an upbeat tempo and I am sure to work up a sweat! What is something that you’ve learned thus far about working on a team and/or in a professional environment? Work with the information that you have and if need be, ask questions. But you’ll almost never have every minute detail given to you, so do the best with what you have. Be genuine. Do not try to hype up your accomplishments, service hours, skills, etc. Be genuine and that will shine through on the application.